There is nothing like an Assembly not opening and a warning error message making an appearance to send a mild panic through you. What to do? Is a question you see posted on the SOLIDWORKS Forum occasionally. Especially from those not on a current subscription! I have seen this error a few times over the years. My experience with the message have occurred when we have been working on a reasonably large assembly on one computer and go to open it on another of our computers. The Assembly will now Open. All parts and sub-assemblies will be Suppressed. It is then just a case of Unsuppressing each of the individual parts or sub-assemblies one at a time. I’ve never had a situation where a part or sub-assembly didn’t Unsuppress. After I have unsuppressed all the parts & sub-assemblies I have been able to Saved the assembly. I would then open each of the parts & sub-assemblies from the Assembly, rebuild each and save. Once all appears to working correctly I delete the created configuration. However if a part or sub-assembly didn’t unsuppress then at least, you hopefully, will have found the cause of the problem. If it is a sub-assembly then you can work through the same procedure until again, hopefully, you can isolate the problem to an individual part! Hopefully you will never experience the Error message. But if you do, hopefully this will help you panic just a little less! I cannot thank you enough! Thanks for the guide… really helped me out. Thanks for the insight. Now I just have to spend my days checking out parts, opening them., wafting for them to rebuild and save them. Honestly, these work-arounds are non-starters for companies that make large assemblies or use document control or have large data-stores of files. I can’t afford to take my operation off line every time a new release comes out so that I can resave the 30K+ files I have in my datastore. 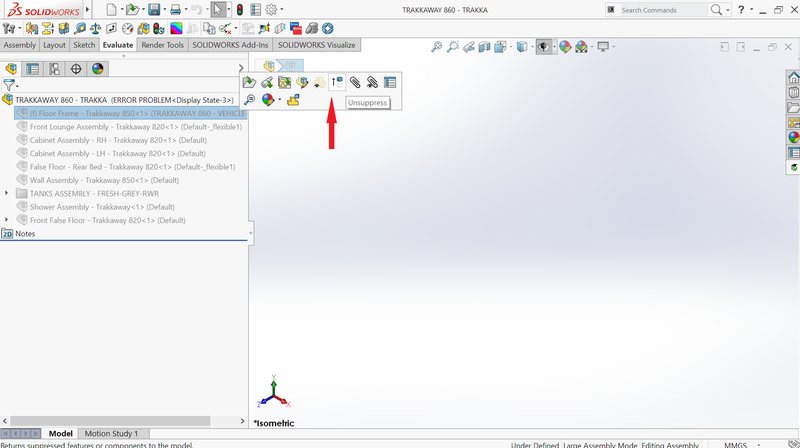 File corruption is an issue Solidworks Corp needs to take much more seriously. 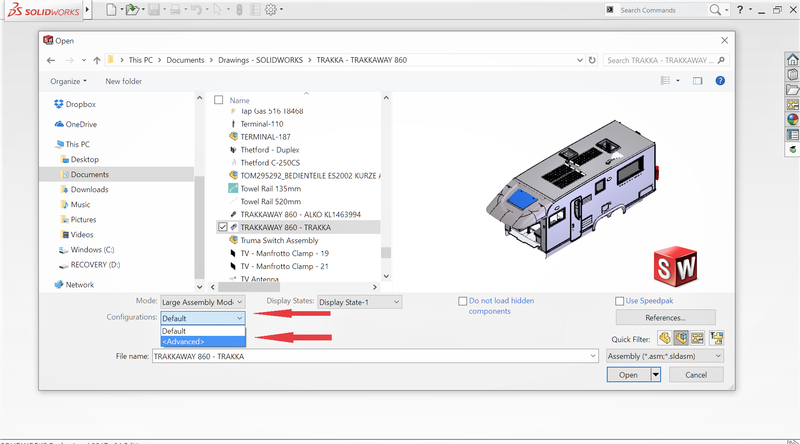 The tools included with Solidworks are not adequate. This is great but doesn’t work for an assy drawing…the assy opens but the error comes opening the slddrw of the assy and you don’t have the config option. Thoughts? I must admit I have never had the problem of not being able to open a Drawing file. Have you opened the Assembly first? I would have thought that if the Assembly was open and if you them tried to open the Drawing, if should have less issues as it is holding the components in Memory. You are right there is no configuration option. There is a sheet option, if you have multiple sheets. What warning do you get with the drawing. The same as with an Assembly if it will not open? 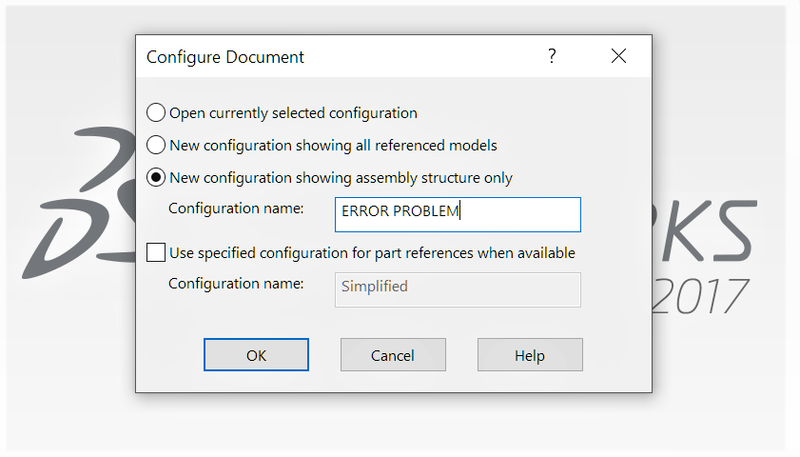 Doesn’t work for me – SolidWorks simply crashes when trying to open the assembly in such a way. Thanks for the write-up though. Are you getting the Error Encountered message? or is the Assembly just crashing? If you use the Advance feature it suppress all parts/sub-assemblies. If it is crashing on opening then it would appear the issue is with the Assembly itself. Can you open independently any of the parts/ sub-assemblies used in that Assembly? This would be the first thing that I would do. Open each of those parts separately. I would also try and create a new version using Pack & Go.